No Easter celebration is complete without the scent and flavour of Easter biscuits infused with the secret ingredient of Cassia oil. Cinnamomum cassia, called Chinese cinnamon, is an evergreen tree originating in southern China. It’s widely cultivated in China and elsewhere in southern and eastern Asia. It’s one of several species of Cinnamomum from which their aromatic bark is used as a spice. Traditional Somerset Easter biscuit recipes contain Cassia Oil – it was believed that oil of Cassia had been used in embalming Christ’s body. Differing from normal essential oils, our Cassia oil is food grade quality having been filtered to remove its bitterness. 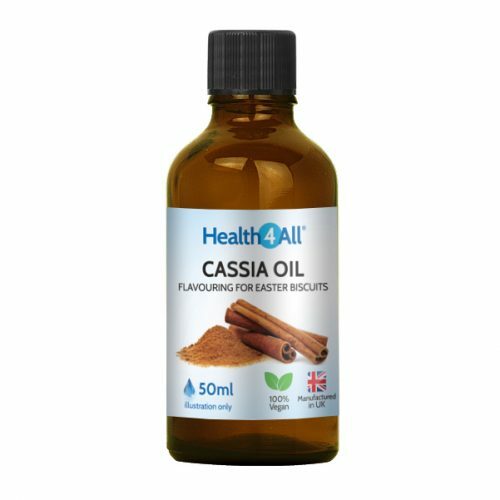 Cassia oil is stronger in aroma and taste than regular cinnamon so it’s important to be sparing with it. A recipe sheet is included with every order so you can make the perfect cinnamon biscuits. At Easter and at any time. 1. Plain flour 275g, Margarine or Butter 200g , Castor sugar 150g, Currants 50g, Egg yolks 1 or 2 , Cassia flavouring oil x 6 drops. Mix the ingredients together. If the mix is a little dry add a little milk. Roll and cut to shape. Bake in a moderate oven for 10 to 15 minutes. 2. Plain flour 450g, mix with Butter 350g , Castor sugar 225g, Cassia flavouring oil x 10 drops and Egg yolks x 6. Divide into balls and allow to stand for 2 hours. Roll out sprinkling in currants, cut to shape. Bake in a moderate oven for 10 to 15 minutes. This product will cause irritation in contact with skin. Wash off immediately with warm soapy water.